The Challenger SB Series "Center-Line Balers" give you the options you want and the features you need to produce high quality hay. The center-line design allows crop to move in a straight line from the time it leaves the pickup until it drops out the back as a finished bale. By using this advanced bale-forming concept, we have eliminated many high maintenance cross-conveying mechanisms still used in other baler designs. If quality hay, unmatched maneuverability and high capacity are required, the Challenger SB Series center-line balers will fill the need. For complete specs download a pdf brochure by clicking here. Overall Width 101 in. 101 in. 104 in. Bale Chamber 14 x 18 in. 14 x 18 in. 16 x 18 in. Bale Length 12 to 52 in. 12 to 52 in. 12 to 52 in. Pickup Width 75.9 in. 75.9 in. 77.5 in. The Challenger LB Series big balers are well suited to be used by custom operators, dairy farmers and hay or straw operations. The LB44 is built to bale hay straw, and package it in the largest bale in the industry. The LB34 and LB33 are designed to bale hay, silage and straw. The Challenger balers make solid, high density bales that stack and ship with ease. The big bales reduce the number of bales handled and stored, cutting manpower requirements to a minimum. Overall Width 100 in. 117 in. 125.5 in. Bale Size w x h 31.5 x 34.4 in. 47.3 x 34.4 in. 46.5 x 50 in. Bale Length Up to 98 in. Up to 98 in. Up to 108 in. Pickup Width 77.5 in. 87.9 in. 83.6 in. The RB34 round baler is the smallest baler in the Challenger variable chamber round baler line. The RB34 baler is sized primarily for operators with lower horsepower tractors. The RB34 is ideal for the smaller farmer who wants to move from small square bales to easier to handle round bales. 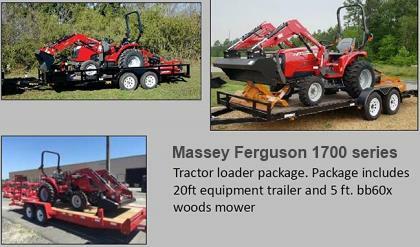 It is also ideal for the small farmer who wants to move away from hiring a custom round bale operator and have control over the timing of his baling. The RB34 is also a good fit for the smaller farmer that is tired of the frequent breakdowns with used balers and wants to move into a new, more dependable baler. The Model RB44 round baler is the second smallest baler in the Challenger® variable chamber round baler line. The RB44 baler is targeted toward farmers needing round balers, but not a large bale package. 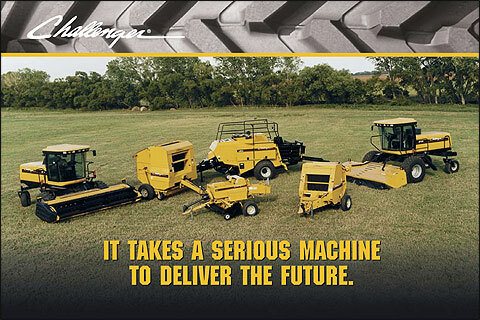 The Challenger® RB46 and RB56 are both "Fully Automatic" Round Balers. The RB46 is a 4' wide by up to 6' diameter Variable Chamber Round Baler, while the RB56 is a 5' wide by up to 6' diameter Variable Chamber Round Baler. By "Fully Automatic" We mean that the baler takes over the tedious manual inputs previously required in the Round Bale making process (i.e. : wrapping, stopping the PTO, opening the tailgate, ejecting the bale, closing the tailgate and restarting the forming belts). An Operator/Baler can be much more productive when manual inputs are not required. For complete specs on the RB34 download a pdf brochure by clicking here. For complete specs on the RB44 download a pdf brochure by clicking here. For complete specs on the RB46 and RB56 download a pdf brochure by clicking here. Overall Width 81 in. 86 in. 111 in. 126 in. Bale Size Dia. 30 in. to 52 in. 30 in. to 52 in. 30 in. to 72 in. 30 in. to 72 in. Bale Width 39.4 in. 47 in. 46.5 in. 61.5 in. Bale Volume 51.7 cu. ft. 57 cu. ft. 119 cu. ft. 145 cu. ft.
Pickup Width 39 in. 49 in. 66 in. 83.6 in.